I was recommended to give the Sunday lunch at The Coney in West Wickham a go by our friends at Sweet Stuff Society in Beckenham, they said they were not sure on the quality but the servings looked huge. As Claire and I were at a loose end, I thought we would give it a go. Booking was easy, one quick phone call later and we were booked in for 1:30pm. We parked our car in the small (and slightly worrying) car park behind The Coney, and walked around the front. Our first impressions were mixed. It was a hot day, so a lot of blokes outside after football training. That, coupled with the car park, put me on edge a little. This was thankfully abated as soon as we walked through. The venue itself was well lit and quite bright (helped by the good weather outside). Adorning the walls were various large canvas photographs of mountainous vistas, and there were mountaineering paraphernalia dotted around the venue. Perhaps a mildly strange environment for serving Sunday lunch, but we gave it a shot. We were greeted straight away by a barlady and served immediately, which was nice and refreshing. The waitress / bar lady was very friendly and welcoming, showing us to our table with the menus. Looking over the various options, both Claire and I decided on the roast beef. When the waitress came over to take the order, Claire wanted the beef cooked medium-well, whereas I wanted medium-rare. She said she’d see what she can do! Our lunch was served about 15 minutes later, the optimum time in my opinion. This looked extremely promising, a lot of meat, a Yorkshire pudding, loads of vegetables, some potatoes sneaking out and gravy. I also noticed some interesting herbs dotted around. Tucking in, I wasn’t disappointed. The roast beef was tender and cooked almost to my liking. 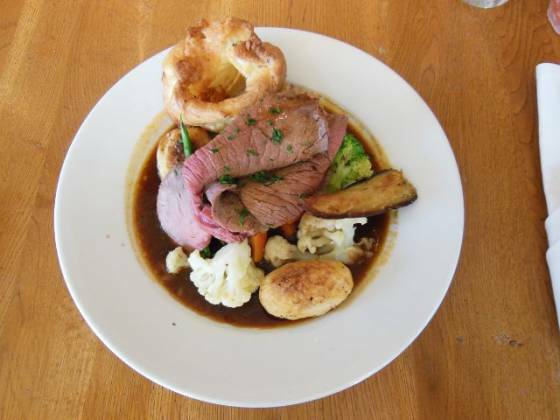 The beef on Claire’s plate was more chunky than slices – so not the same as my carved meat but there again, Claire requested medium to well done and that’s what they served. She was delighted with it (“great use of seasoning”). The roast potatoes were better than average, quite hard on the outside although not crispy. Cutting into them, they had an ok texture – not anything to write home about, but pleasant enough. I was very happy with the vegetables, a nice selection of roast parsnip (which was a bit too cooked), broccoli, cauliflower and carrots. All tasted fresh and cooked well. The Yorkshire pudding was ok – it seemed home made, which is always a bonus. I had a lot more gravy than Claire did, so for her it was a small let down (it didn’t affect the scoring – coming later). After such a large and satisfying dinner, along comes the choice of dessert (not, “I should have one or not”… more “what shall I have?”). The Coney did have a special offer with 2 courses for £13.95, but with a smaller selection of desserts. I decided to choose the banoffee pie, as it’s currently one of my favourites. This wasn’t included in the deal, so cost £5.25 – pretty much standard pricing for a dessert nowadays. 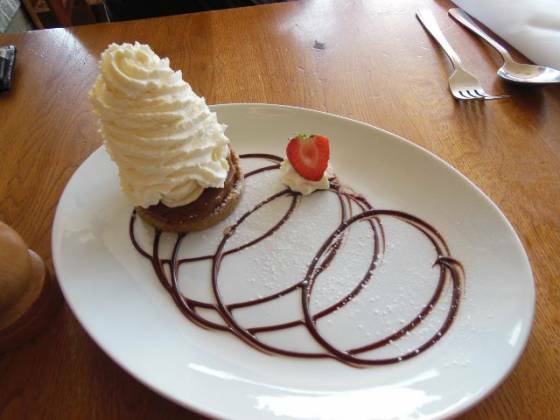 I didn’t need to wait long – out came a slightly lop-sided plate with a banoffee pie and cream in a tribute to Marge Simpson’s hair! “Do I want any pie with that cream?”. It was very nice though – I actually found out that banoffee pie is one of Claire’s favourite desserts, so I must remember next time not to order one (so I don’t need to share ;-)). To wrap up. The service here was very good, met at the bar with the food order taken at the table. The venue and decoration was good, it was very nice being in a bright area. The tables had salt lamp candles which, along with the cloth napkins, gave the impression that the smaller details also count here. 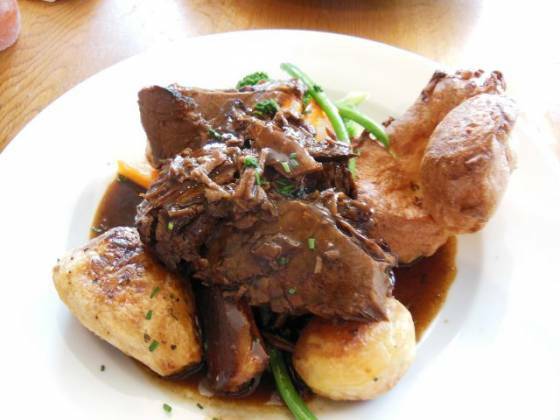 The Sunday lunch was good – we have eaten better roast potatoes, but the meat was good as was the rest of the meal. 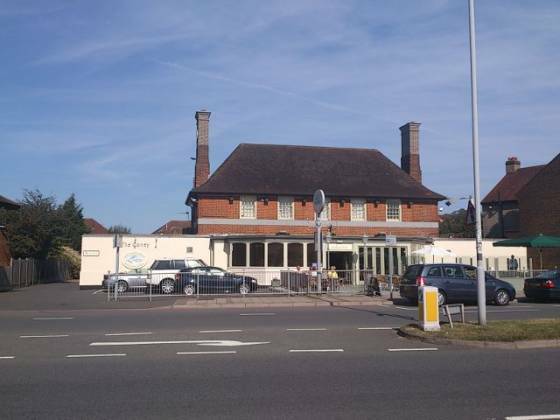 This is a great pub / restaurant to take family as well as friends – there was a large group celebrating a birthday, but being such a large venue, we were not disturbed at all (and the service didn’t deteriorate as it so often does). With this all in mind, we are awarding 4.5 plates out of 5. Highly recommended!